The Pelicans may have traded for the best player at the trade deadline, but they remain an outside shot to make the playoffs. That said, both DeMarcus Cousins and Anthony Davis have been, statistically speaking, “pretty good” since the trade. Tonight they overwhelmed the Blazers’ front line, finishing with a combined 37 points, five blocks, 24 rebounds, and one extra cool alley-oop. Beating the Blazers is very important for the Pelicans! It probably doesn’t matter! Portland is in ninth place in the Western Conference, now 2.5 games ahead of the Pelicans. The problem is, there are too many teams between them and the promised land. Denver currently holds the eighth seed, five games ahead of New Orleans. They somehow play Denver three more times (twice at altitude), but even if they sweep all three, they still need to vault Portland, Minnesota, and Dallas, and hold off Sacramento. Staying ahead of the Kings won’t be hard, but getting by four other teams will. FiveThirtyEight gives them lower than a one percent chance to make it. They’ll most likely be spending their April somewhere other than in Oakland losing to the Warriors in the playoffs. This is primarily because they’ve played a very difficult schedule and done so with backcourt stocked with guys who can’t shoot. Boogie is under contract with the Pelicans for another year after this one, and the immediate fate of the franchise depends on how well their big dudes can gel. 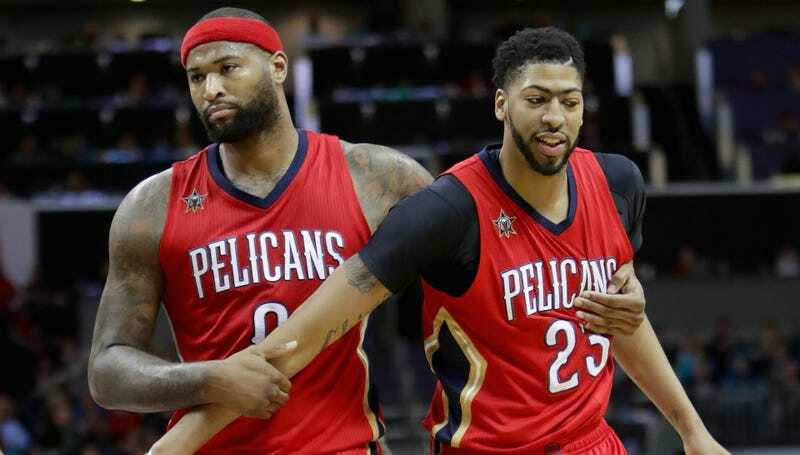 Making the playoff this year was a goal, but even after the trade, it was never considered a lock, and a full season of Davis and Cousins will be the place to judge them as a duo. I hope Alvin Gentry’s plan to get them on the same page next year involves a ton of alley-oops.